Twelve-year-old Zoey Kate is a cooking prodigy, born with an innate skill to combine unlikely foods to create a mouth-watering, savory meal, young Zoey takes out a massive bank loan in order to open her own restaurant and compete against local, world-renowned chefs for a cooking award. Helping Zoey is her friend Dallin, a large, slow-witted, football-playing best friend. Not helping so much are Zoey’s parents, jazz musicians who are mostly hands-off in her up-bringing, though they do co-sign her loan. Working against Zoey are local chefs who see her as a threat to their business and will stop at almost nothing to take the coveted prize in the up-coming competition. This is a fast-paced adventure and so fitting that Zoey puts her restaurant on wheels (one of San Francisco’s cable cars). The story moves quickly with a lot of ups and downs (again, so suitable for being in San Francisco) and the reader may just be breathless when finishing the book. The key to the book, of course, is Zoey. She is the driving force (and I think ‘force’ is just the right word here) for everything that happens. As such, she is an original and outstanding character. The second most active figure is Dallin. Unlike Zoey, Dallin is a stereotype, which is too bad. He’s the ‘dumb jock with a heart of gold.’ He is also easily manipulated which Zoey takes great advantage of, though she does come around to understanding that he’s not just meat-muscle but does have feelings. Although this is a short book, the second half of the book is much more interesting and attention-holding. Once the ‘villain’ is identified (and it happens the moment he tells Zoey she’d better not open a restaurant near him) and we learn about the contest, the story moves at breakneck speed and we can’t help but be drawn in. The first portion of the book, the set up and identifying of the characters, however, nearly had me quit reading. Although Zoey is a cooking prodigy, what Zoey really has, in spades, is confidence. We start the book with her at the bank to get a very large loan so that she can open her own restaurant. Her confidence is so high that she (literally?) can not hear the word ‘no.’ She is precocious and over-the-top and not just a little bit annoying. It is tempting to say that she doesn’t understand her own limitations (like many youngsters) but she actually HAS no limitations. Combined with her poor treatment of Dallin, she does not come off very nicely early on. Get her cooking, though, and she’s much more fun. Teens and ‘Tweens reading this book will miss some of the adult elbow-nudges and winks. Zoey’s parents are jazz musicians which surely must be the most bizarre and outrageous of occupations for the target reading audience, but people like me of course think it’s pretty ‘cool.’ We adults will ‘get’ the names like ‘Monk’ and ‘Gershwin’ and ‘Bird’ we’ll know why at least one of them is so very laid back. We’ll also see the humor in names like Chef Cannoli and Kim Chi, though those, at least, we can explain. Looking for a good book? 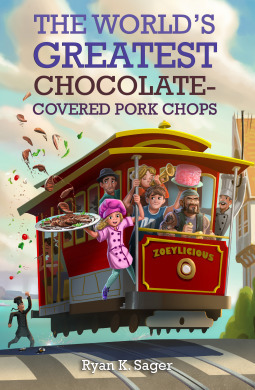 Given the popularity of cooking programs on television there surely must be a market for food-related and cooking stories for kids and The World’s Greatest Chocolate-Covered Pork Chops by Ryan Sager will fit right in. There’s a lot here to enjoy and the ride is wild and raucous, but the rough start might turn readers off.